← Are we Living like Easter Saturday Believers in an Easter Sunday World? On Good Friday, some of us gathered to read through the Bible account of the days and hours leading up to and including Jesus’ death. We read a section together, paused to reflect on what we had read and then there was space for anyone to say anything if they wanted to. I don’t remember reading this bit before. This makes you wonder if we really read the whole Bible with enough time and space to take it in? I’m sure that every Christian reads the Bible and we might also hear it read in church but what we are not always so good at is stopping to think about what we have read and to let it sink in. Sermons are often the worst examples of this, where we fling a large amount of information at people, sing a closing song and end the service. For those of us who preach and lead in church, we need to consider how we build reflective space in to the teaching elements of the service so that we can help people to learn. Do we try to read the whole Bible over time or do we repeatedly just read our favourite bits? Do we know what the Bible says about who Jesus is or do we just assume that we know who he is? 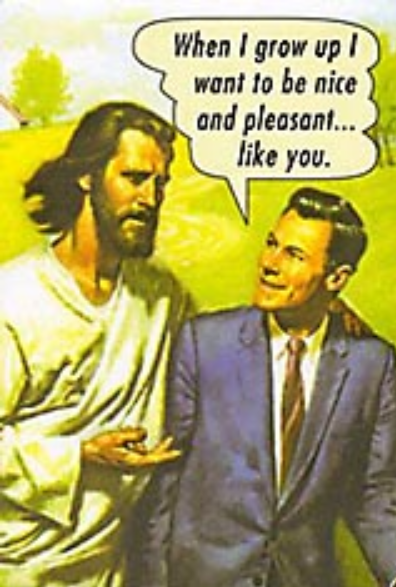 Do people seriously think he is just nice and pleasant as this cartoon suggests? Finally, how can we give ourselves the space we need to consider what we are reading in the Bible? What would work for you, being silent, writing notes, being creative eg drawing or painting, discussing with others or perhaps something else? Any thoughts? How can we read and digest the Bible in a more effective way? Please comment below with any suggestions. Of course, another way of looking at this is that something new leaps out at us every time we read a Bible passage and for this we thank God. This entry was posted in Bible, Faith, Life experiences and tagged bible, do we know what the Bible says?, Good Friday, how to read the Bible, life experiences. Bookmark the permalink.